Our customers have left reviews about their experience with us on the CMCA hosted website RV Pages- read what they have to say about us! Set of driver cabin insulation screens for various models. On special from $239 only! 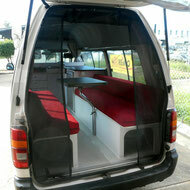 Change you drivers and passenger seat insert and match you interior colour scheme. This can be done for VW crafter, Mercedes Sprinter and Fiat Ducato vehicles- the setas MUST be delivered to us!! 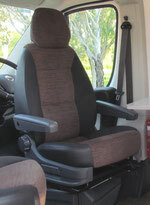 We offer NEW inserts for your driver and passenger seats, the set of seat inserts from $485 onwards. Price includes taking the old seat covers off and refit the new ones. 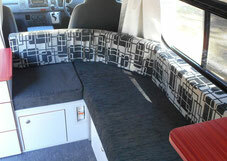 For Fiat Ducato price includes padded head rest in fabric too. We general use 100% sunblock curtain fabric with a full 3 pass block out lining on the back. Price per curtain from $55 - please contact us for a quote! The complete curtains have draper tape on the the rear and we supply each curtain with the hooks and D-slides to fit into the general used mini curtain tracks. Perfect for the DIY customer- our special; range of discounted fabrics, some colours only $10 per meter! We can offer 30 different patterns and fabrics from suppliers like Gummerson and Profile. Please make sure to send us your contact details, as we need precise measurements of you for each curtain. Any questions, please feel free to call us! After many years of use or the purchase of a used van, you may considering getting the foam changed and take the chance to change the colour scheme inside your RV. 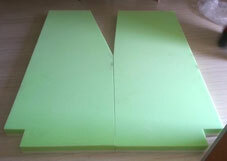 We have a wide range of high quality, eco friendly produced foams. For comfort lovers: dual layers with memory foam toppers can be mades as well as we can offer Latex mattresses for people with allergies. Please call us for a quote or send us a email!